There are times when you come across a recipe and you are like I have to make this right now, even though you have already slated your Dinner menu, that one look at those beautiful photo and you are just in Love with the food. Food blogs are harmful they should come with a statutory warning, ” Your Dinner plans might change after a visit to the page” I came a cross this recipe some time back, and I cannot recall the website, must have been a fleeting glance and all I remember, I fell in love with the color, and the simplicity of the dish. The thing was that we had a lunch invite that day so it wasn’t happening . By dinner time had forgotten the name of the website. The thing is that I had to have it, I had to cook it. You see there is a method to my madness, when I like something, I try to make a mental note of the ingredients, so I remembered, there was eggs and tomatoes. You cannot go wrong with these ingredients so, even though it may not taste exactly same as that recipe on the website, having said, I did not quite know what it tasted like, I knew mine will be edible as well. The thing is I have never been fond of poached eggs, but I was blown away with this recipe. How much more perfect can this simple concept be? 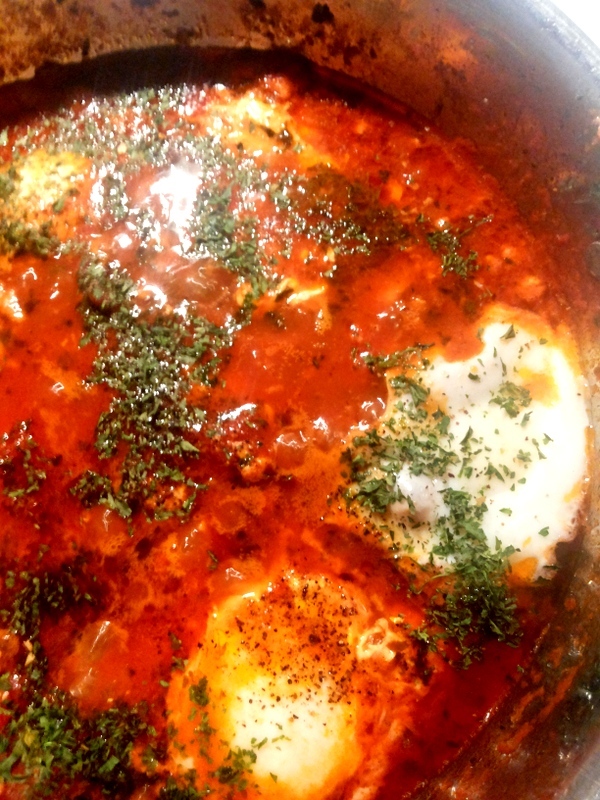 The rich tomato sauce, married to the egg-poached-a match made in food heaven. The best part about this madness is that you can add as many ingredients as you want. I’ve seen versions with spinach, feta, chickpeas, sausage, mushroom and ground chicken. Do what ever pleases you. 2 14 oz. cans of crushed tomatoes ( I used one 28 Oz Whole plum tomato sauce cans) but you can used diced or anything you please. Heat large saucepan on medium heat. Add the oil and melt butter,then add the cumin seed and temper or a minute, once it starts to release the aromas add and cook onions and garlic till soft. Next add crushed tomatoes with juices , Worcestershire, hot sauce and sugar. Stir till everything is combined well. Bring the sauce to a low boil, then reduce heat to low. Stir in the parsley and the freshly ground pepper and simmer the sauce on low heat for about 10 minutes on low heat, stirring occasionally. 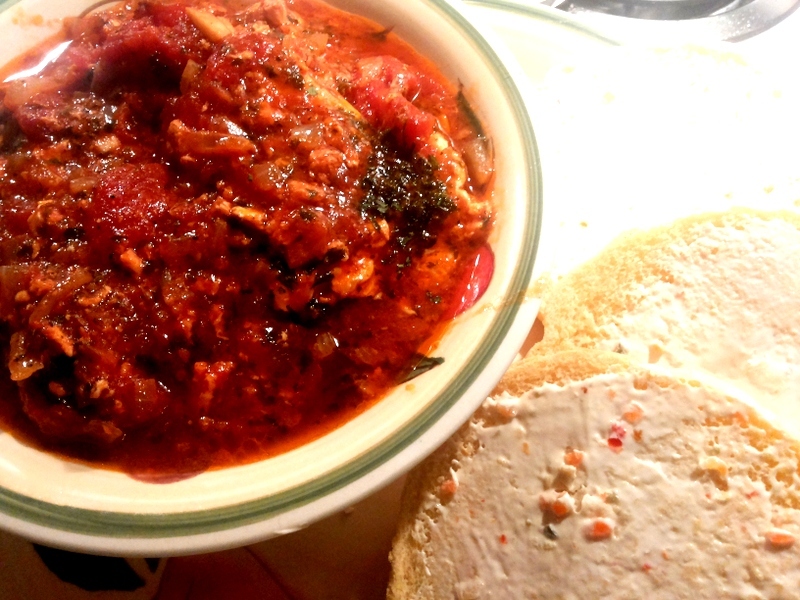 Serve the egg and tomato sauce in a bowl and dip with the toast. Serve warm. If you like your yolk a bit runny then Poach the eggs in the sauce for about 5-8 minutes, or until the whites are set and the yolk is still runny. This reminds me of egg curry only the eggs are poached instead of boiled. Which makes me now want egg curry with poached eggs. It’s always good to find a new idea for eggs. I do not think my wife uses egg in her sauce.. but i will show this to her for sure.. I wouldn’t have thought of putting these ingredients together, but it looks really good! Great idea, sounds and looks delicious ! 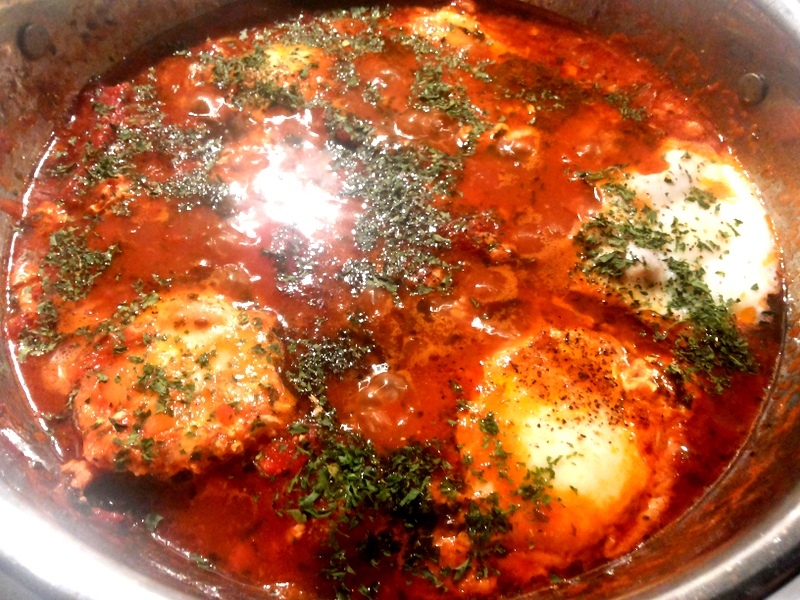 Never heard of eggs in tomato sauce. I should give it a try! I have never tried anything like this before. My eggs usually just have a little salt and pepper on them…lol. I will have to try that sometimes. This sounds like something (two) of my kids would like! Thanks for the recipe. This looks soooo good!!!! I have never tried this before but I am going to have to try it now.